As predicted, the first brilliantly sunny day to follow the showers and rumbling thunderstorms has produced Mayflowers. 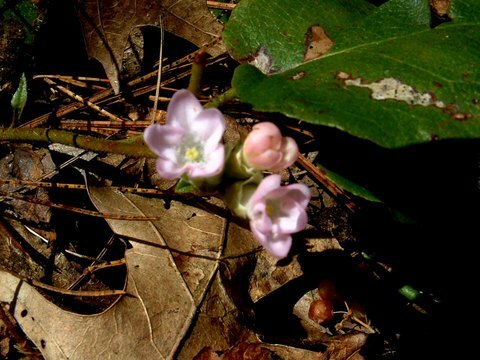 Trailing Arbutus is beginning its bloom along the woodland trail. Many, many moons ago, there lived an old man alone in his lodge beside a stream in the thick woods. He was heavily clad in furs; for it was winter, and all the world was covered with snow and ice. The winds swept through the woods; searching every bush and tree for birds to chill, and chasing evil spirits over high hills, through tangled swamps, and valleys deep. The old man went about, and peered vainly in the deep snow for pieces of wood to sustain the fire in his lodge. Sitting down by the last dying embers, he cried to Kigi Manito Waw-kwi (the God of Heaven) that he might not perish. The winds howled, and blew aside the door of his lodge, when in came a most beautiful maiden. Her cheeks were like red roses; her eyes were large, and glowed like the fawn's in the moonlight; her hair was long and black as the raven's plumes, and touched the ground as she walked; her hands were covered with willow-buds; on her head were wreaths of wild flowers; her clothing was sweet grass and ferns; her moccasins were fair white lilies; and, when she breathed, the air of the lodge became warm and fragrant. The old man said, "My daughter, I am indeed glad to see you. My lodge is cold and cheerless; yet it will shield you from the tempest. But tell me who you are, that you should come to my lodge in such strange clothing. Come, sit down here, and tell me of your country and your victories, and I will tell you of my exploits. For I am Manito." He then filled two pipes with tobacco, that they might smoke together as they talked. When the smoke had warmed the old man's tongue, again he said, "I am Manito. I blow my breath, and the lakes and streams become flint." The maiden answered, "I breathe, and flowers spring up on all the plains." The old man replied, "I breathe, and the snow covers all the earth." "I shake my tresses," returned the maiden, "and warm rains fall from the clouds." "When I walk about," answered the old man, "leaves wither and fall from the trees. At my command the animals hide themselves in the ground, and the fowls forsake the waters and fly away. Again I say, 'I am Manito.'" The maiden made answer: "When I walk about, the plants lift up their heads, and the naked trees robe themselves in living green; the birds come back; and all who see me sing for joy. Music is everywhere." As they talked the air became warmer and more fragrant in the lodge; and the old man's head drooped upon his breast, and he slept. Then the sun came back, and the bluebirds came to the top of the lodge and sang, "We are thirsty. We are thirsty." And Sebin (the river) replied, "I am free. Come, come and drink." And while the old man was sleeping, the maiden passed her hand over his head; and he began to grow small. Streams of water poured out of his mouth; very soon he became a small mass upon the ground; and his clothing turned to withered leaves. Then the maiden kneeled upon the ground, took from her bosom the most precious pink and white flowers, and, hiding them under the faded leaves, and breathing upon them, said: "I give you all my virtues, and all the sweetness of my breath; and all who would pick thee shall do so on bended knees." Then the maiden moved away through the woods and over the plains; all the birds sang to her; and wherever she stepped, and nowhere else, grows our tribal flower -- the trailing arbutus. Flower Essence: This essence will impart faith in the cycle of life. It is an excellent essence for making new starts. Use this essence when there has been a rebirth into a new life, either literally as with a newborn child, or figuratively, as when marking a milestone or initiation into a completely “new” life. This would be especially useful if the process of initiation or birth has been painful in any way, or when the path ahead looks difficult. There will be recognition that there is a divine plan, and that the journey is worth it. The sweetness of life will be emphasized. A calmness and feeling of protection and connectedness with all life is imparted. Supports spiritual awakenings. What a stunning and powerful and important flower that is! I love hearing the stories and the folklore about wildflowers. We had our first giant storm here and for BC, that's saying something because we don't usually get lightening but it struck my neighbourhood which fell into chaos for about half an hour.